Despite their defeat by the Athenians at the Battle of Marathon in 490 BC, the Persians were not finished with their determination to conquer mainland Greece. For the Persians, Marathon barely registered; the Persians after all controlled almost the entire world: Asia Minor, Lydia, Judah, Mesopotamia, and Egypt. The loss at Marathon was no more than an irritation to the Persians. Darius was unable to respond immediately to his defeat because of rebellions on the other end of his empire. While he was quelling these, he was killed in battle. 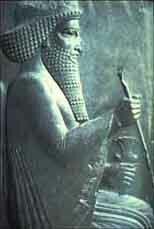 King Xerxes, son of Darius, ascended to the throne of Persia after his father's death in 486 BC. After securing his throne, Xerxes began to muster forces to once again invade Greece. He was determined to avenge his father's defeat. By 480 BC, Xerxes had built up an enormous army of some one hundred fifty thousand men and a navy of six hundred ships. Peoples from many little-known nations in the vast empire of Xerxes joined in the army of the Great King to invade little Greece. 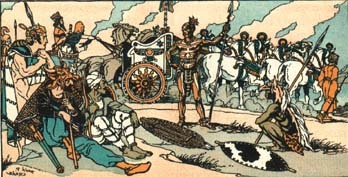 Following the chariot of Or'muzd are soldiers from India, Thrace, Chal'y-be'a and both Ethiopias. The Greeks heard of Xerxes army amassing and were better prepared for the invasion than in the first Persian War (the Battle of Marathon). Athenians and Spartans combined with about 29 other city-states, under the leadership of Sparta to oppose this powerful army and the Athenians contributed a fleet of 200 triremines for their navy. 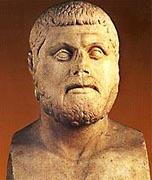 Themistocles, an Athenian general, convinced the Athenians that the battle would be won at sea and that the profits from a newly discovered silver mine should be used to build a navy. He knew that the Persian army could only succeed if it were successfully supported by supplies and communications provided by the fleet. Travel by sea was perilous; armies always traveled by land when possible. 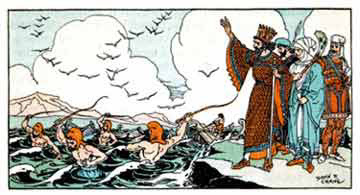 Xerxes decided to cross the Bosporus and travel by way of Thrace, Macedonia and Thessaly. 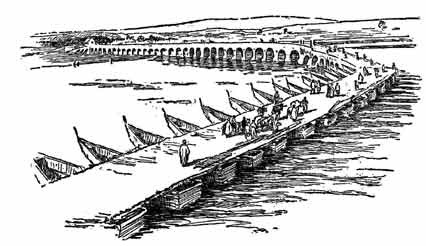 To cross the Bosporus, he had a boat bridge built with each boat connected to the other with planks. This bridge would be over a mile long and required a perfectly calm sea. On several attempts winds and rough seas broke it apart. Frustrated and enraged, Xerxes ordered that the Bosporus receive three hundred lashes with a chain. Properly chastened, the sea remained calm and the bridge was completed. Some Greek city-states in the north submitted to the Persians rather than face destruction. One reason was because the stronger city-states in the south, such as Athens, Sparta and Thebes, had decided not to meet Xerxes in the north. Thus these latter city-states stood alone against the Persian giant. The Greeks together had three hundred ships and ten thousand men, with the ability to raise about fifty thousand. 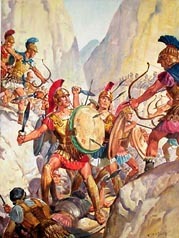 They were led by King Leonidas of Sparta who brought with him three hundred Spartans. The small turnout of Sparta resulted from a disagreement as to where best to meet the Persians. Sparta wanted to fight at the Isthmus of Corinth, others wanted to fight further north and Athens still insisted that the war would be won or lost at sea. 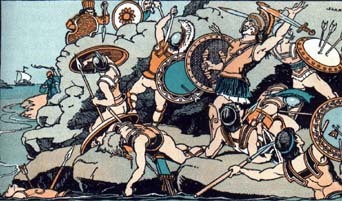 The Greeks realized that it was imperative that Xerxes be delayed as long as possible so that the Athenians could desperately build up their navy. They decided to send an expeditionary force north to meet Xerxes, to fight the Persians at hopeless odds, and to sacrifice themselves in order to improve the chances of ultimate victory. They decided to take this stand at Thermopylae. The Greek army, led by King Leonidas of Sparta, was about ten thousand strong and in position at Thermopylae, when the Persians arrived. Xerxes was incredulous that they would take a stand against his immense army. After impatiently waiting four days while warning them to surrender, he launched a massive attack. 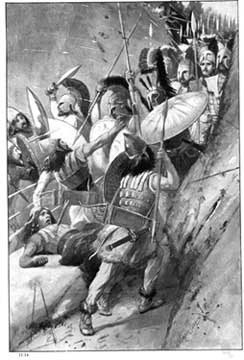 The Greeks, as at the Battle of Marathon, initially retreated drawing the Persian army into the narrow pass. Then they turned and waged a furious battle against the limited number of Persian who had entered the pass, thoroughly routing them. Time and again the attacking Persians, including the elite immortals, were unable to get through. Unfortunately, a Greek traitor named Ephialtes told Xerxes of an alternate route around the pass. He led a large part of the Persian army to attack the Greek forces from the rear. 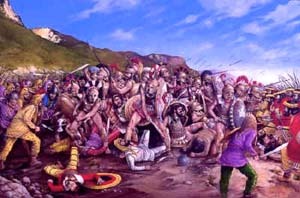 Leonidas learned of this treachery and decided to evacuate the Greek army while holding the pass with only three hundred other Spartans long enough for the army to make an organized retreat. 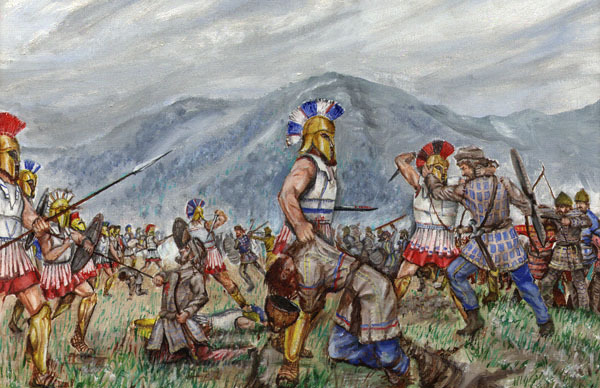 The battle at Thermopylae ended with every last Spartan fighting until they were killed. This distraction gave enough time for the rest of the Greek army to retreat into southern Greece. Ephilates expected to be rewarded by the Persians but this came to nothing when they were defeated at the Battle of Salamis. He then fled to Thessaly with a bounty on his head. According to Herodotus he was killed for an apparently unrelated reason by Athenades of Trachis around 479 B.C. After this battle, the Persian army advanced into central Greece and marched into Athens burning and sacking it late in the summer of 480 BC. However, the Athenians had already evacuated to the city of Salamis on an island west of Athens where the Greek naval fleet was also positioned and prepared for a last stance against the Persian powerhouse. This fight would be known as the Battle of Salamis.